It's happened to far too many of us, far too many times. You leave your car unused for a long period, be it for an extended vacation or you are moving and can't take it with you immediately, and later find it necessary to have the car serviced just to get it running normally. It is possible to avoid this to an extent if follow take the correct steps. Here are some tips on how to store your car properly so that you will not have to spend on servicing when want to make use of it again. Engaging the handbrake over an extended period can result in the brake pads getting stuck to the discs or drums. Needless to say, if this happens, you'll be in some trouble the next time you drive the car. The smarter thing to do would be to use wheel chocks, say a piece of wood or even a brick, to keep it from rolling and leave the car in first gear. If possible, park your car indoors. It'll be safer and cleaner. If you don't have this option, invest in a quality cover. Make sure to buy one made for your car model or type. Also, avoid using the cover indoors as this will ensure any moisture that is left inside will evaporates faster, especially in humid weather. If you are going to leave your car idle for a long period, it's advisable to remove the spark plugs and spray a little oil into plug sockets before putting the plugs back again. This will help to prevent the insides of the cylinder-head rusting and keep away the moisture. You can also use fuel additives that provide a protective coating to the insides of the engine. 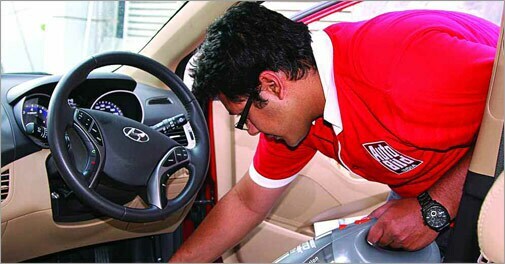 Of course, do this only if you're comfortable handling the mechanics of the car. This might be stating the obvious, but we're going to tell you anyway. People tend to leave trash in cars, including chocolate or biscuit wrappers (with crumbs inside), old newspapers, water bottles and so on. All of this could rot or, worse, attract rodents that can damage floor mats, seat covers and even wiring. So, clean the interior thoroughly and spray a little freshener. But don't use too much as even as it will stink in the closed confines over a long period. One of the major problems of leaving a car unused is rusting on the inside of the fuel tank. The best way to avoid this is to fill the car to the brim with quality petrol, and even add some fuel additives. This will keep away moisture entering the tank and prevent rusting of the fuel tank. Of course, be sure that the tank is sealed properly as well. It is better to remove the battery if you're going away for a long time. Also, smear petroleum jelly or grease on the terminals and the wire ends to prevent rusting. Ensure that the battery is fully charged and top up the water level. Store the battery in a cool and dry place, well away from direct sunlight. A car's paint job can be damaged if the vehicle is parked outdoors, even with a car cover protecting it, due to the dust, grime and moisture. To prevent damage, clean the exterior thoroughly. Make sure to remove any dirt, dust or grime stuck to the vehicle before applying a coat of polish and wax. This will help in keeping moisture away. Using the car cover will offer complete protection. Cars that have been stationary for long periods develop flat spots on tyres. To avoid this, use four jacks (or blocks of wood) so that the car doesn't rest on the wheels. Sports cars with low profile tyres can be left without support for as much as two months without any damage to the tyres. It'll help to change engine oil and air filters. Used oil contains moisture, metal filings, sludge and other corrosive elements. It's best to put in fresh engine oil and new filters before leaving. However, Do drive the car for a few kilometres so that the fresh oil is circulated inside the engine. Check the tyre pressure and make sure the tyres are at the correct pressure. Proper inflation help prevent cracking of the sidewalls and flat spots. Check the valves and valve caps for leaks and that the valve caps fit properly.